During the early years of the Twentieth Century, the Golden Age of Sail was in rapid decline. Tall masts and billowing white canvas were disappearing from the horizon only to be replaced by the smokestacks of modern steamships. Those hard-working sailing ships shared a romance unlike any other mode of transportation or commerce. Thoughts of sailing a tall ship would sound good to anyone, but to Frank Swift, a young boy, it was enchanting. He had spent hours fantasizing about life under sail, especially while in his grandmother's attic going through a sea chest that had belonged to his great uncle, a harpooner aboard a whaler in the 1840s. When Frank decided to go to sea, he became a cadet on the New York State school ship Newport, a formal sailing vessel of the U.S. Navy. After training and at the age of 20, he became an able-bodied seaman, shipping out with the Barber Line. He was quartermaster aboard a steamship headed to the British Crown Colony of Hong Kong. 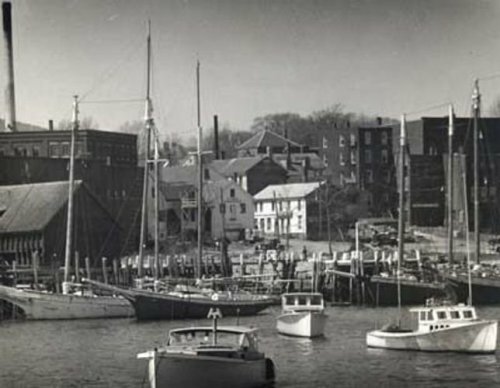 Some of the vessels in the Maine Windjammer Cruises® fleet in the old days under Capt. Frank Swift anchor in Camden Harbor. The public landing is much different from today's site. She was the first vessel he owned outright. 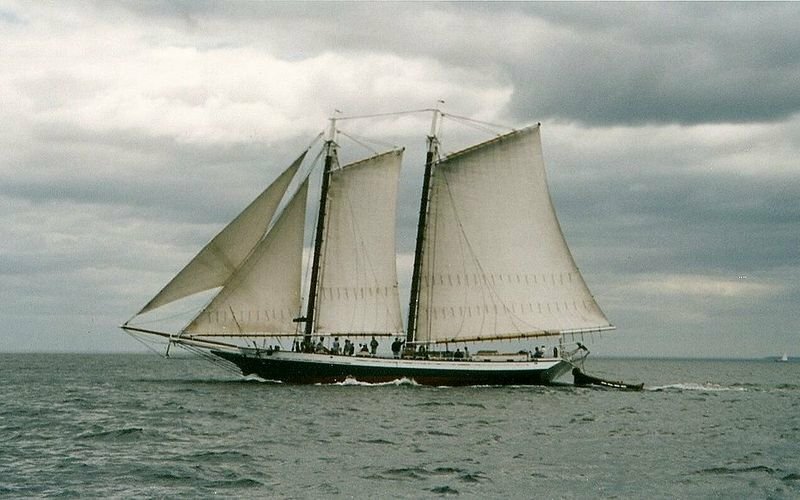 He operated his third season with all three vessels as Maine Windjammer Cruises® from Camden, and business took hold. Additional income allowed him to advertise, but the majority of the business came from word of mouth. For 25 years Capt. Swift operated more than a dozen vessels, saving them from an early demise as the era of cargo schooners came to an end. CAMDEN, MAINE — The large sailing vessels have removed their winter covers, and are beginning another busy season as they leave Camden Harbor for a week at a time. The passengers, who have booked for a week of sailing along the Maine coast, board on Sunday and leave on Monday morning about 9 a.m. They visit all the nooks and crannies on Penobscot Bay, enjoy good food and have a happy time with lots of singing. The guests onboard see Camden and many places along our coast from a different view. Some have never been on a boat before. Captain Frank Swift had the idea and put it to work in 1935. He bought five old sailing vessels that had once carried cargo but were no longer usable for that. He patched and painted until they were ready to sail. It became a profitable business and is carried on by others today. 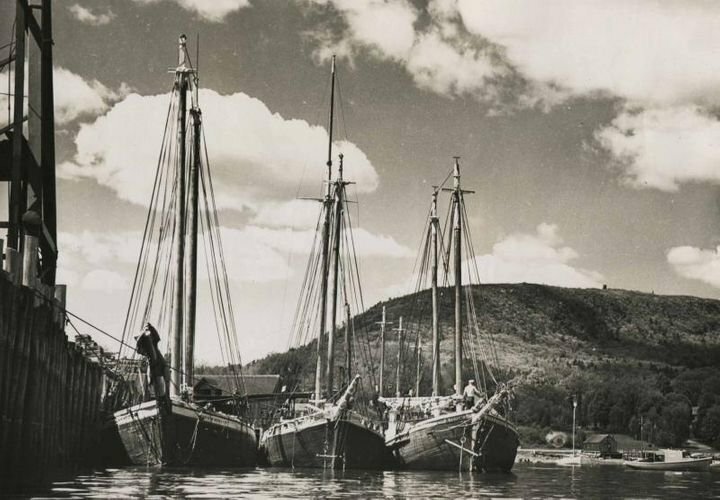 The Camden Herald mentioned that on June 8, 1942, his schooner Lois Candage set sail for its first trip. It was later joined by the Clinton. In July, the three remaining ships joined in the weekly excursions. Swift’s windjammer cruises continued throughout the summer of 1943. World War II was on so in addition to passengers, the ships picked up pulpwood at various ports and delivered it to paper mills. That year became his best one in the eight years of operation. There were three schooners scheduled through September 15, and the Mattie was booked into October. 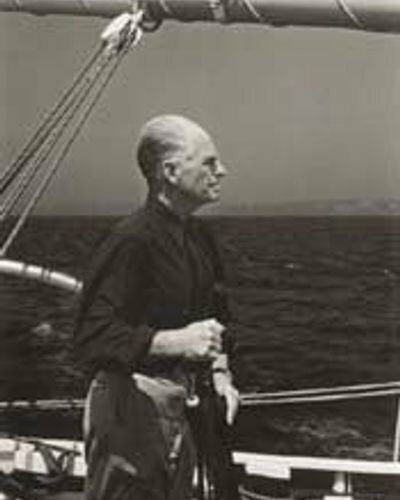 In 1944, his windjammers set sail for their ninth year under the name of “Vagabond Cruises.” He bought property on the waterfront from Camden Lumber Company (formerly Ayers Fish Market) for his headquarters. Swift started his tenth season in June of 1945 when the Enterprise and Indra set sail. By 1947 he had eight schooners sailing out of Camden. They were the Lois M. Candage, Mattie, Clinton, Eva S. Cullison, Mercantile, Enterprise, and Mabel. 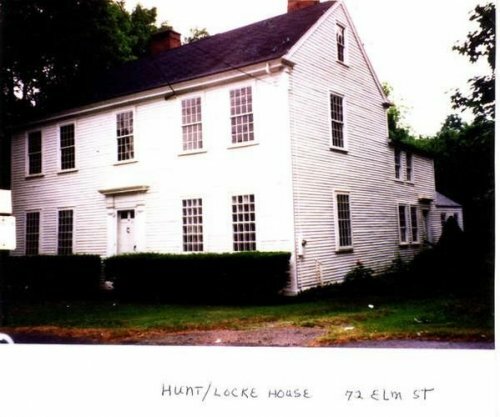 Captain Frank Swift and wife Mary lived in the Hunt-Locke house on 72 Elm Street in Camden. They owned it for 20 years and kept it very much the way it had been when the house was built in 1810. The article, reprinted in part, written by Barbara F. Dyer.